The province I live in, Sichuan, has roughly the same population as the entire nation of Germany. Now, consider that Germany has a handful of well-known big cities like Munich, Frankfurt, Berlin, and Hamburg, just to name a few, that spread the population across the country. Sichuan also has many large cities spread across the province yet compared with the famous German cities, chances are that no one outside China (or possibly even outside of Sichuan) has heard of them. The point I am trying to make here is that large population does not automatically give a city international clout. Although Chengdu, the provincial capital and largest city in Sichuan, has come up on the international radar in recent years (thanks in part to the terrible earthquake back in 2008), the city is still an afterthought compared with more high-profile cities on the east coast like Beijing and Shanghai. This is not to mention all the 3rd and 4th Tier in the province that are gaining population like Mianyang, Nanchong, Suining, and Ya’an, among several others. Mianyang, for instance, has a population of 5.2 million residents. Nanchong has 7.3 million residents. It should also be noted that the scope of what defines a ‘city’ in China is generally larger by means of what is actually counted as part of an urban area compared with other cities around the world. Cities in China are generally defined at the prefecture level, meaning that there could be several smaller ‘towns’ within a given prefecture (city). This arrangement most likely has to do with China’s system of top-down government and keeping a consistent hierarchical line of command from the central government down to the provincial, prefecture and even village level. 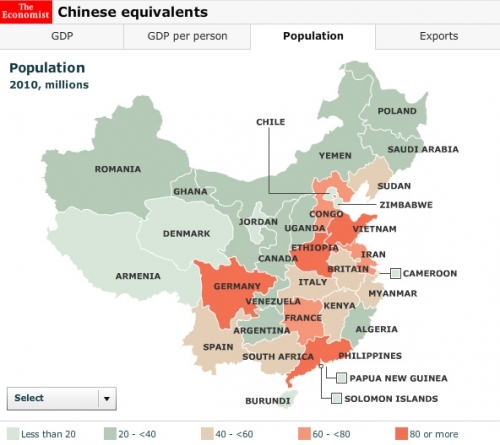 Another interesting part of The Economist infographic is the comparison of Chinese provinces with different countries in terms of per capita GDP. What this tells us is that despite China’s number two spot on the list of world’s largest economies, from a per capita basis, the country still has a lot of developing to do. 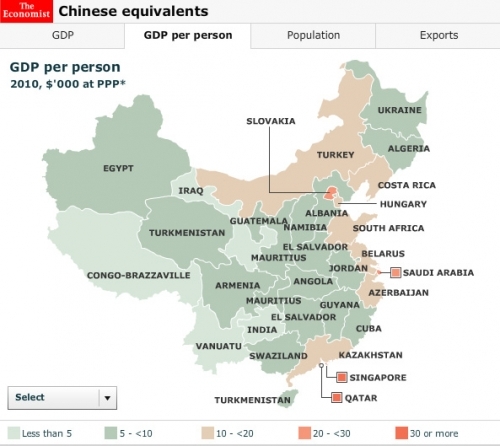 Tibet has the same GDP per capita as Congo-Brazzaville, Shanxi the same as Namibia and Henan the same as El Salvador! Granted ,these are poor provinces in comparison to their eastern neighbors, yet offhand one would not expect these numbers from the world’s second largest economy. Oftentimes, China’s leaders will loudly declare that China is still a ‘developing country’ when accused of not being a responsible player regarding issues such as carbon emissions or human rights. They may have a point. Though China has come a long way in lifting millions out of poverty into the middle class over the 30+ years since reform and opening, the transformation is far from complete. The country will continue to urbanize well into the future, fueled by its enormous and ambitious population.